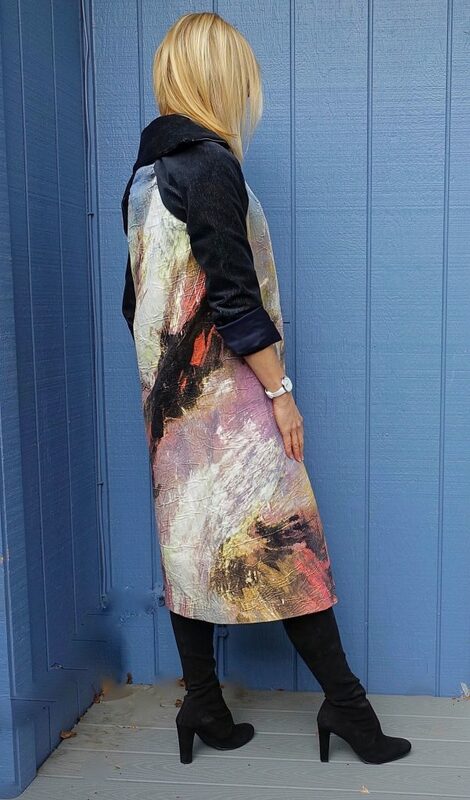 I am so excited to introduce you to a one-of-a-kind piece I recently purchased: this Emily Payne statement coat. If you’ve been following the STYLetti a while, you’ll know that I’m a huge fan of Emily, one of the top designers both in Season 13 and All Stars, S5. 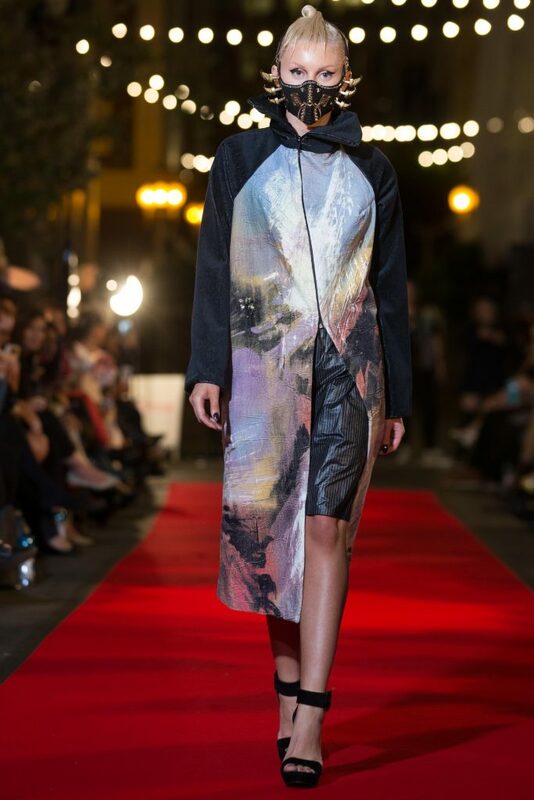 While I was writing a post about Emily’s show for San Francisco Fashion Week, she let me know that this coat – my favorite piece from the Leather Tongue collection! – and a few other samples of hers were for sale. I just about died! I love the asymmetrical shape, contrasting collar and sleeves, and the Monet-like print in velvet! I especially love a statement coat this time of year when outerwear is so important. After moving to Seattle from California, I’m having to incorporate into my wardrobe more cold-weather pieces. I am thankful to have some great wool coats now in solid colors, but this one is a breath of fresh air. A coat with three-quarter sleeve coats has also been on my wish list since last year. It’s so many great things rolled into one! Right now there’s actually snow on the ground in Seattle. I might not be wearing it in those temperatures, but while I am here on the central coast of California – and year round here! – it is absolutely perfect. I also imagine wearing it in Seattle with a wool sweater underneath when the temperatures go back up a bit. Since the coat is so striking, I didn’t want to wear it with anything but black. I chose a black three-quarter sleeved sweater, short straight skirt, and boots. And as a matter of fact, I’ve concluded that these Stuart Weitzman OTK suede boots were made to go with the coat! It seems that Stuart Weitzman is really into suede these days. My last three pairs of shoes by that brand are suede. Although it is a very sensual material, I suppose it isn’t the best choice in the rain. I have, however, worn these in mild rain with no issues whatsoever. And they go perfectly with the ribbed black velvet sleeves and collar of my new coat. One last but really awesome thing about this coat is that the designer made every bit of it herself. That is so special in this day and age when production gets farmed out to factories in countries where workers are paid next to nothing. Big brands, like Dior and Dolce & Gabbana have ateliers with amazing designers working under artistic directors to ensure excellent quality. But there’s something so much more personal and close-up about buying something from an independent designer like Emily. It takes an amazing talent, creativity, and focus to do the work that Emily does. As an Instagram follower of @EmilySuePayne, I’ve seen how she recently detached little tiny beads from a fabric to make it perfect for a wedding gown. What you saw on Project Runway was just the tip of the iceberg! I urge you to also contact independent designers to find out about their pop-ups and their latest work. 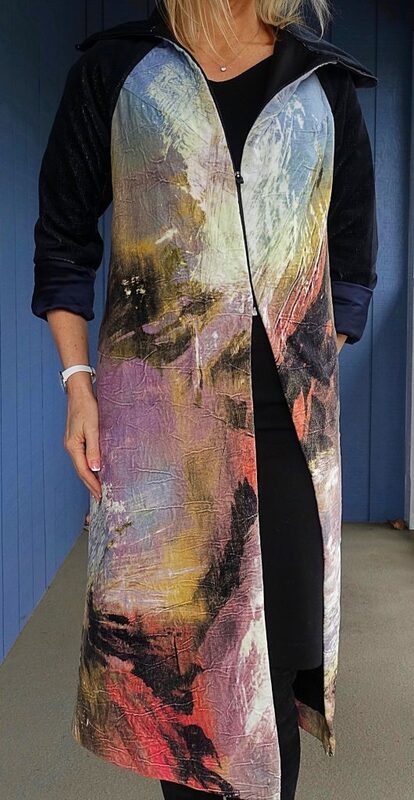 You too can find a truly unique piece like this amazing Emily Payne statement coat. If you want to reach Emily, by the way, you can message her on Facebook. I hope you like the outfit! I’m looking forward to sharing next a dress by another Project Runway designer very soon! Janea, as always, it’s perfect! I found you through the Sartorialist…am not involved in the fashion industry in any way but was gifted a style gene by my mother. 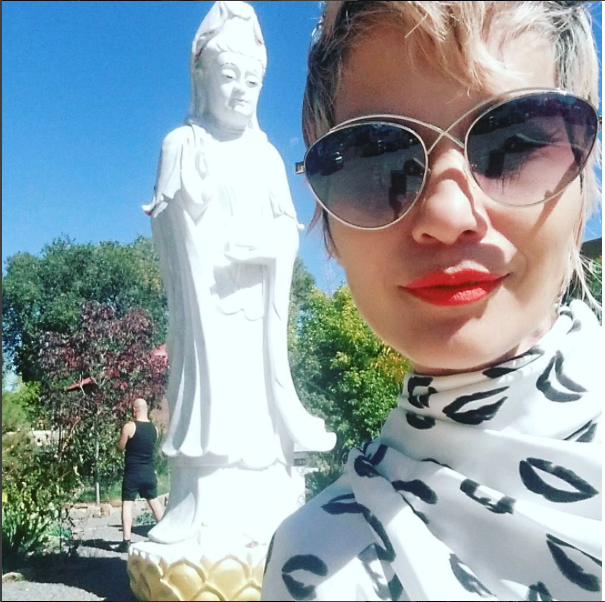 For awhile I was posting my own OOTD on FB and then decided it might come off as a bit vain – it was just fun for me. It would definitely be more appropriate in a blog that I have dreamed of but will most likely never do. Coats are a particular favorite of mine however living here on the SW gulf coast of Florida we have almost no use for them whatsoever. I have said for quite a few years, if I buy another coat I should be shot. 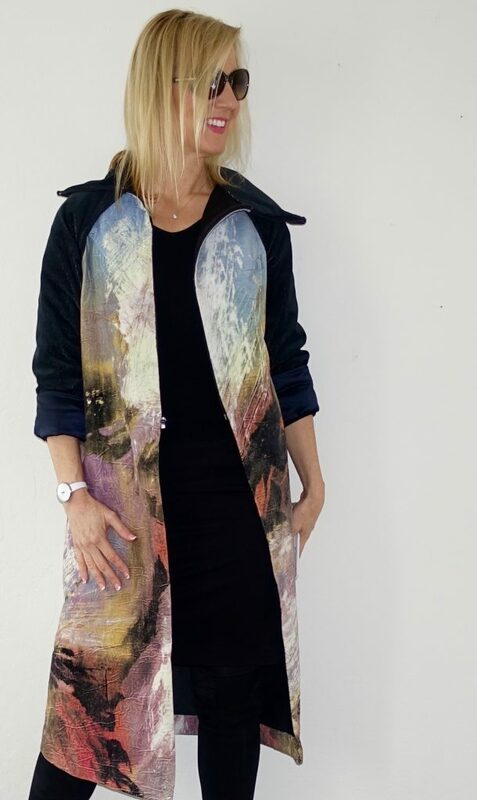 While this coat (or should I say work of art) is not ‘my style’ I can appreciate it’s beauty and why it lights your passion. The whole outfit is quite wonderful. You look so stylish and so happy. The boots have me swooning!! I love everything on you, especially your coat! 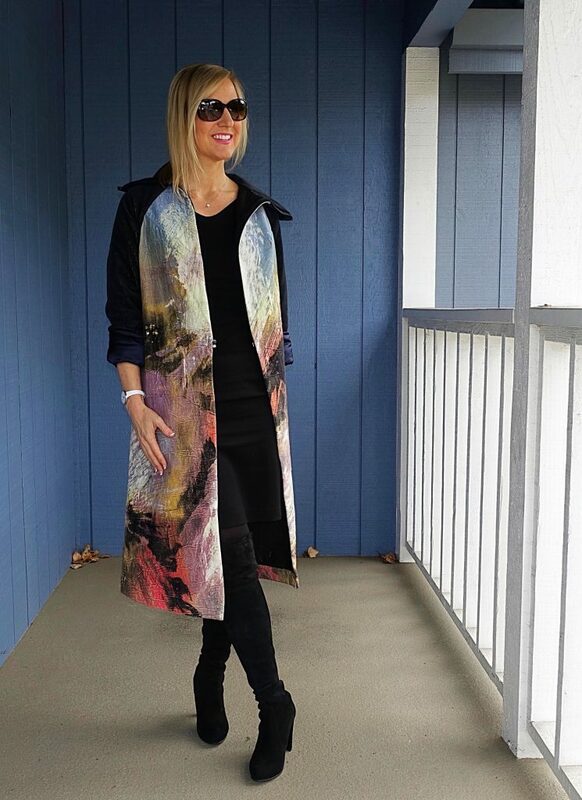 This coat is really a piece of art and it makes a fabulous combo with black. You look great! This coat is a true work of art, I like how you’ve paired with a black total look. Those over-the-knee boots are wonderful!